PORTLAND author Carol Hunt is currently working on her fourth book in her series of stories set on the island. Carol lives in Easton on Portland with her three teenage children. She studied English Literature and History at the University of Chichester and has worked in publishing and as an adviser to young people. 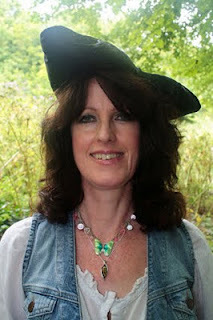 She has written three books in her Portland Chronicles series – The Portland Sea Dragon, Enchantment of the Black Dog and Portland Pirates – published by Roving Press, and is currently writing her fourth – The Portland Giant. When not writing, Carol enjoys spending time with her children, driving them to majorettes, ballet and various rock concerts. WHAT do you like most about West Dorset? I enjoy living close to the sea and I like the people of West Dorset. The Isle of Portland continues to fascinate me with its windswept cliffs, pirate graves at Church Ope and lighthouse. I am always finding out new things about Portland. WHAT inspired you to start writing? My children. I didn’t have to look far for inspiration to start writing about annoying and unreasonable characters. I am also fascinated by local folklore; the Veasta or Chesil Beach Sea Monster, the Mermaid found at Church Ope and the weird legend of the phantom Black Dog at Cave Hole, Portland Bill. WHAT top three tips would you give to an amateur writer? Write about who and what you know, ask for feedback from your readers, don’t be afraid to take risks. My stories combine research into 17th century history with contemporary children, surf dudes who are obsessed with the weather, and Gregor, a badly behaved collie. When I ask children who they like best, they almost always say Gregor or Ryder, the super-cool surfer. WHO is your favourite author and why? I admire the author Terry Pratchett who writes about the Discworld and the city of Ankh-Morpork. His characters include Rincewind, a hopeless wizard and Death, the hooded Grim Reaper who tries so hard to understand people. Tiffany from A Hat Full of Sky is one of my favourite characters as she is brave and resourceful. WHAT is your all time favourite book and why? The Lion, the Witch and the Wardrobe by CS Lewis, the first Narnia book. I identify with the children as they explore Narnia. Lucy is very sensible and Edmund betrays his family for Turkish Delight. I am fascinated by the White Witch and think she is a bit misunderstood. It’s okay to want to live in a permanent winter, with ice, snow and beavers, and turn people you don’t like into stone. I’d like a sleigh, a fur coat, a lot of Turkish Delight and sole charge of Narnia. WHO would be your three dream guests at a dinner party and why? Sam Vimes, Commander of the City Watch in Terry Pratchett’s The Fifth Elephant, who is extremely surly and attractive. Lula, a former ’ho from Janet Evanovich’s Seven Up, who tests the limits of lycra in stretchy animal print dresses. And Nigella Lawson, who would make a mess in the kitchen. I would expect a big row at some point. WHAT was the last book you read? I read Keith Richards autobiography Life. It’s fantastic, like having Keith pop round for a rock ’n’ roll party without having to go to the supermarket for a crate of whiskey. Or apologise to the neighbours the next morning. This entry was posted in Uncategorized by Carol. Bookmark the permalink.